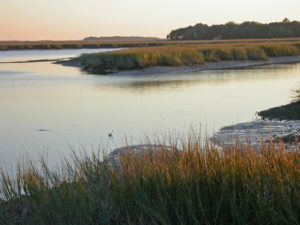 Hudson Creek, part of the Georgia Coastal Ecosystems LTER site. On the boundaries of fresh and saltwater systems, coastal marshes give rise to diverse, productive ecosystems that act as carbon sinks. Their secret? Freshwater marsh plants receive just the right amount of nutrients and salt from periodic seawater tides to thrive. However, incursions of saltwater into these systems are increasing —often caused by drought and sea level-rise—and threaten this delicate balance of salt and freshwater. A long-term study at Georgia Coastal Ecosystems LTER found that seawater intrusions have rippling effects on coastal marshes that ultimately decrease plant productivity and carbon sequestration. Scientists replicated natural conditions and increased seawater intrusion conditions in several plots of marshland as part of SALTEx (the Seawater Addition Long Term Experiment). They treated some plots with periodic—or “pulse”—saltwater additions to mimic the naturally occurring tides that flow into coastal marshes, and exposed others to a constant dose of saltwater—or “press” doses—to replicate seawater intrusion conditions. They found that chronic seawater intrusion altered the system’s chemistry and salinity—spurring a chain reaction of ecological effects. Most notably, plant abundance and growth decreased, which reduced cycling and sequestration of carbon, but also suppressed methane emissions. Fewer plants also mean there is less decomposing plant matter to regenerate the soil. Without constantly building up a fresh layer of new soil, coastal marshes may be more vulnerable to sea level rise. “This study adds to a growing body of literature illustrating how increased salinity, either chronic or acute, can release nutrients stored in freshwater marshes, potentially contributing to eutrophication in open waters as the nutrients are flushed out of marsh soils,” explains lead author Dr. Ellen Herbert. The scientists point out that more gradual seawater intrusion events may have different effects on the system, such as the emergence of brackish vegetation in place of less-tolerant freshwater plants. Nonetheless, these results confirm that even the smallest changes in water chemistry, soil nutrient availability, and other aspects of coastal marshes can upset the balance of these ecologically valuable systems, and change their contributions to climate warming via carbon and methane cycling. Source: Herbert et al. 2018. Differential effects of chronic and acute simulated seawater intrusion on tidal freshwater marsh carbon cycling. Biogeochemistry 138:2.